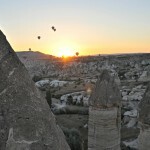 Day 538 In Beijing: Sunset Over Goreme, Turkey. Jill and I were excited about watching the sunset over Goreme since we had heard so many wonderful stories of this city at night. Jill had been here before but hadn’t been here with me so it was new for her also. 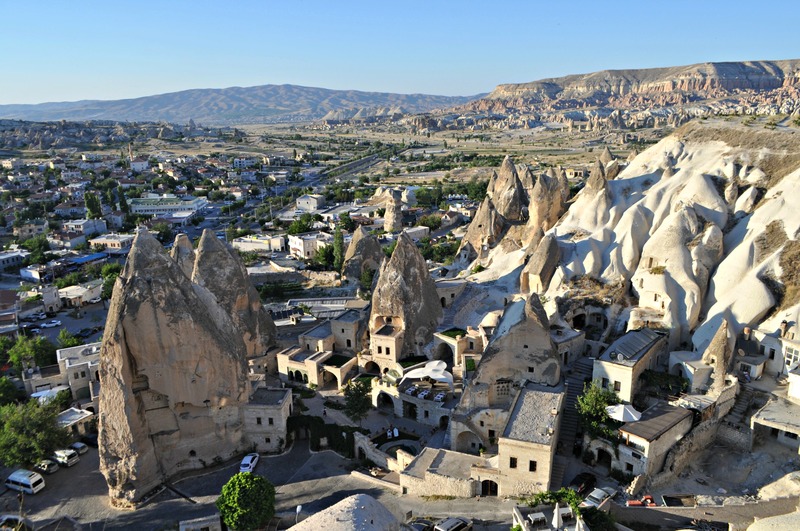 We went up to the platform overlooking the city and just hung out, with other people, and enjoyed the beauty. 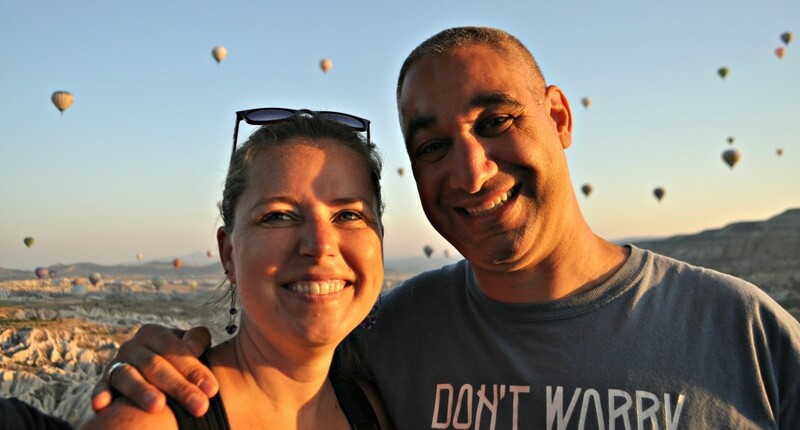 It is truly a magical place and it will always be remembered as the city where I asked Jill to marry me and she accepted as we flew across the sky in a hot air balloon. One of the nice benefits of watching this video is you finally get to hear Jill speaking instead of me! 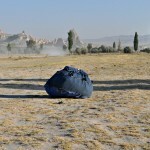 Day 536 In Beijing: Hot Air Balloon Ride Over Cappadocia, Deflating the Balloon. Just before our landing on the trailer. 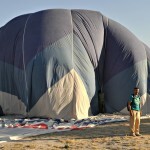 After the landing on the trailer, they started to deflate the balloon. They opened up the top, so the hot air would escape quickly, and Captain Mike’s dog, Maggie, decided to help by running around, carrying her leash, and just being happy to see her master. 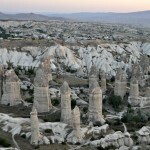 It was really cute and a wonderful way to come “back to Earth” after this heavenly ride through the skies of Cappadoccia, Turkey. 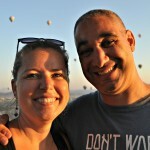 Day 535 In Beijing: Hot Air Balloon Ride Over Cappadocia, Landing on a Trailer. Another group watched as we flew over them. 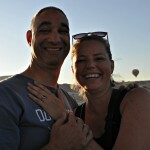 After Jill agreed to be my fiancee, the balloon ride was about over. From what it sounds like, these guys work long hours, and Captain Mike is a really decent guy who tries to make their jobs a bit easier. The balloon lifted up off the ground, and into the air, about 10 feet above the ground, and the crew used the ropes to maneuver it onto the trailer. 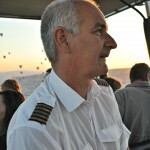 It was a pretty cool way of ending our flight and seeing just how masterful Captain Mike was as a pilot. 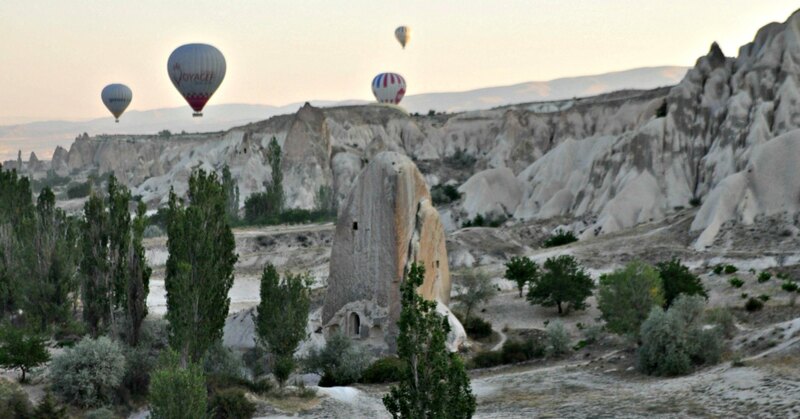 He’s been flying for over 20 years and really has a calm and peaceful attitude, even if his nickname is “Mad Mike” because he likes getting so close to the Fairy Chimneys and trees (we actually brushed the top of one with the bottom of our gondola. It was exciting!). I have to say that it was probably one of the best moments of my life and I don’t think there is any other way that I would have asked Jill to marry me. I also don’t think she would have preferred to be asked in any other way. It will be a memory that will last our whole lives together and is a testament to how we want to live and travel for as long as we can. 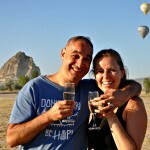 Day 534 In Beijing: Hot Air Balloon Ride Over Cappadocia, JILL SAID YES!!!!!!!! As you know, Jill and I bought a ring for her yesterday. 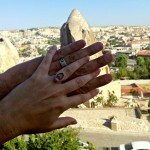 She thought it was just a ring that would look nice and not mean anything more than something that would help us to remember our trip to Cappadoccia. Little did she know that I had other plans for it. I’m about as unromantic as they come. Luckily, Jill is even less romantic than I am. I was married once before and Jill has never been married. I don’t think she had any expectations that she and I would marry, and instead, we’d just travel the world and live our lives together in an unmarried state. 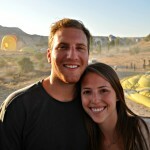 As we were about 2/3 of the way done with our hot air balloon ride, I knew I needed to move quickly. The noise from the fire heating the balloon made it difficult to have a long enough time, in silence, so that she could hear me ask her so I had to think quick. Then he looked at me, winked, and I knew what he was doing. 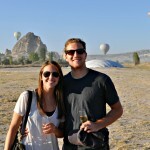 As we hovered over the field, I asked our new friend, Brent, to take my iPhone and video us. By the way, the sounds you hear in the background are not Jill’s. They are from Abby. It cracks us up because it is so heartfelt and honest. You can also hear Brent saying, “Oh my god!” as he films us. I think Brent did an amazing job and I love that he caught us, Abby’s cute noises, Captain Mike, and the balloons in the background. And all in 47 seconds. They added so much to this perfect day. Jill’s smile lights up the sky! 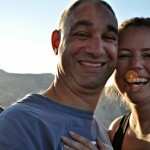 The happy couple with our rings. 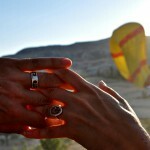 Her ring is from Turkey, mine is from the Hopi Reservation. Abby and Brent. A lovely couple we were very thankful were with us today. 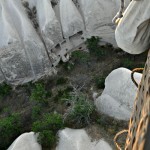 Day 533 In Beijing: Hot Air Balloon Ride Over Cappadocia, Random Shots. 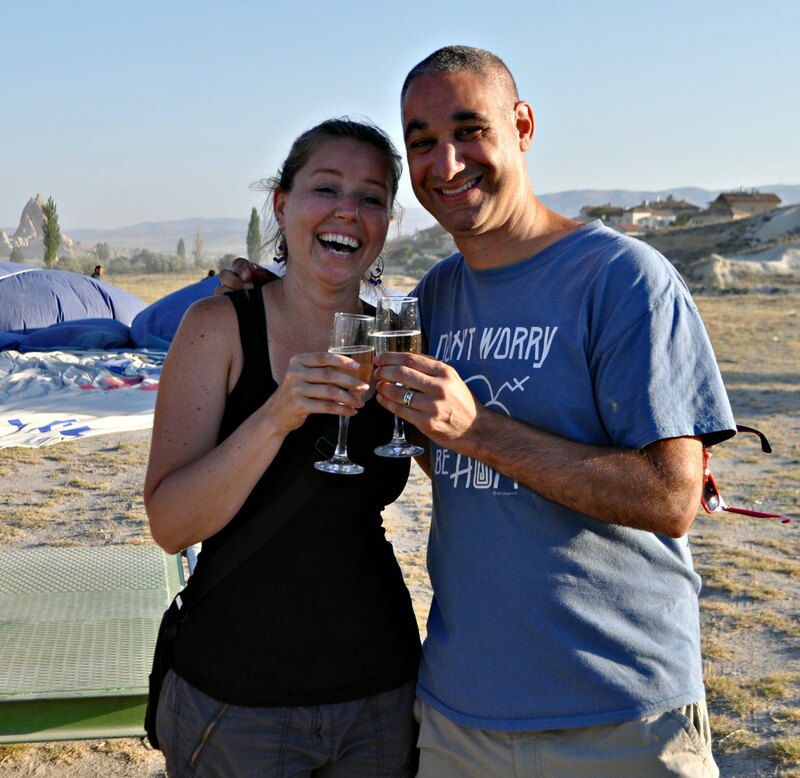 Jill and I had so many amazing shots of our flight on Butterfly Balloons that we decided just to publish a few of them without much commentary. 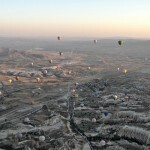 Wide angle shot of the balloons. A close up of a Fairy Chinmey and a small “home” inside it. Beautiful designs in the sand. 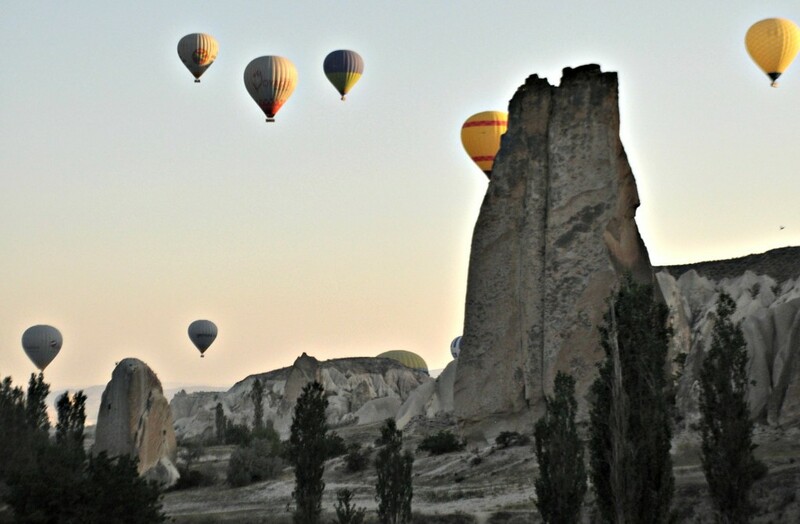 Balloons and a major rock formation. 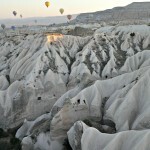 Another rock formation and balloons. 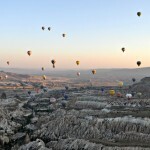 More balloons in the valley. As our journey gets closer to an end. 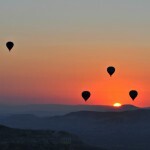 Balloons in front of the sun. 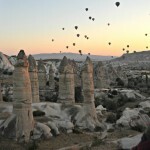 Day 531 In Beijing: Hot Air Balloon Ride Over Cappadoccia, Fairy Chimney Videos. I’ll let the pictures, and videos, speak for themselves. 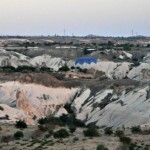 Closer to the Fairy Chimneys. 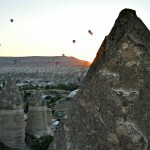 Day 530 In Beijing: Hot Air Balloon Ride Over Cappadocia, Fairy Chimneys. 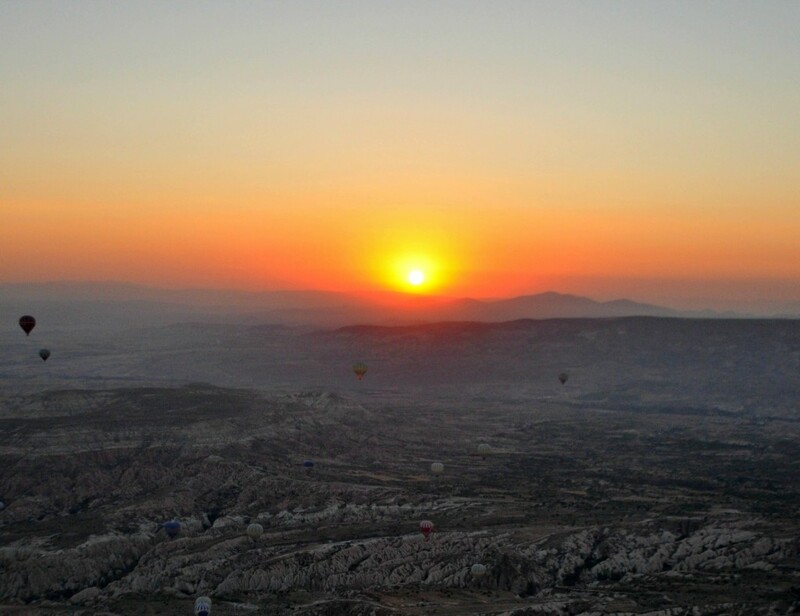 After watching the sunrise, the balloon went straight up, as high as they could take us. 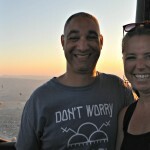 It was fantastic to look out from our gondola and just see the land below us. 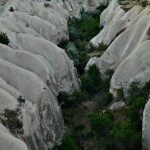 After descending, Captain Mike took us into one of the one of valleys that was full of Fairy Chimneys. 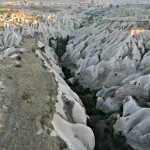 Again, we were overcome with the amazing beauty of nature. 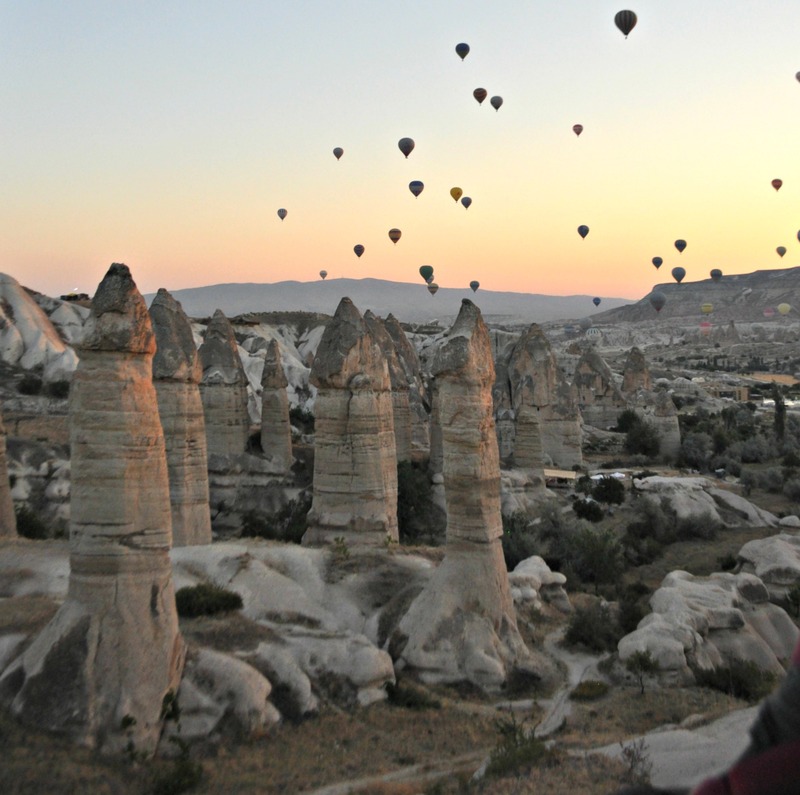 The Fairy Chimneys were massive and there was a silence in the morning, that was only really broken by the fire from the hot air balloon being heated and a few of us talking, in hushed tones, about the wonders we were experiencing. 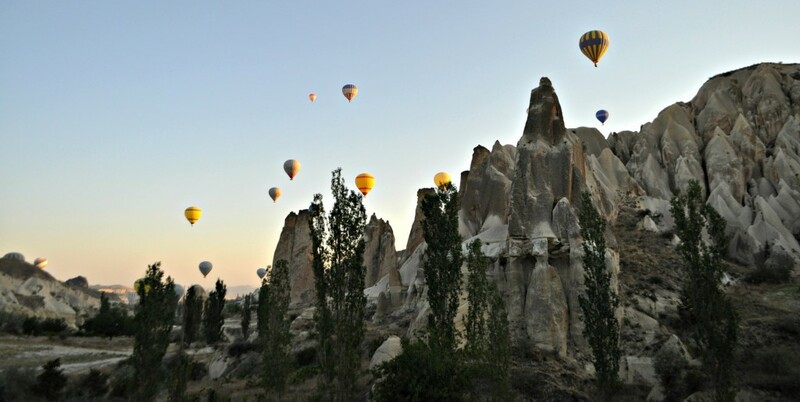 I wonder, now, what kind of thrill, if any, Captain Mike, has as he guides the balloon through the valleys and across the plains? I have a feeling, from watching him as he looked out, he still loves it deeply. He also has a great sense of humor and was able to show his joy by his comments and by pointing out things we might have missed because we were trying to see so much at once. 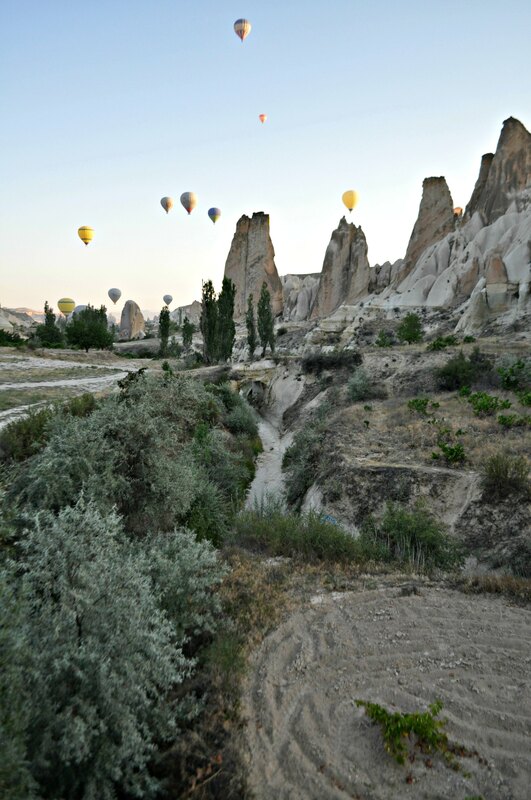 I can’t imagine how amazing it must be, day after day, to be able to take people up in balloons, see this amazing landscape, and share that with people that see it for the first time. 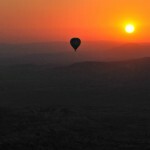 It has me now interested in learning how to fly a balloon, or a plane, for the first time in my life. 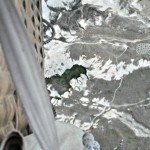 The view from above the Earth. 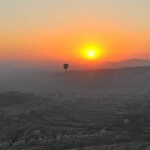 A single balloon drops into the valley. 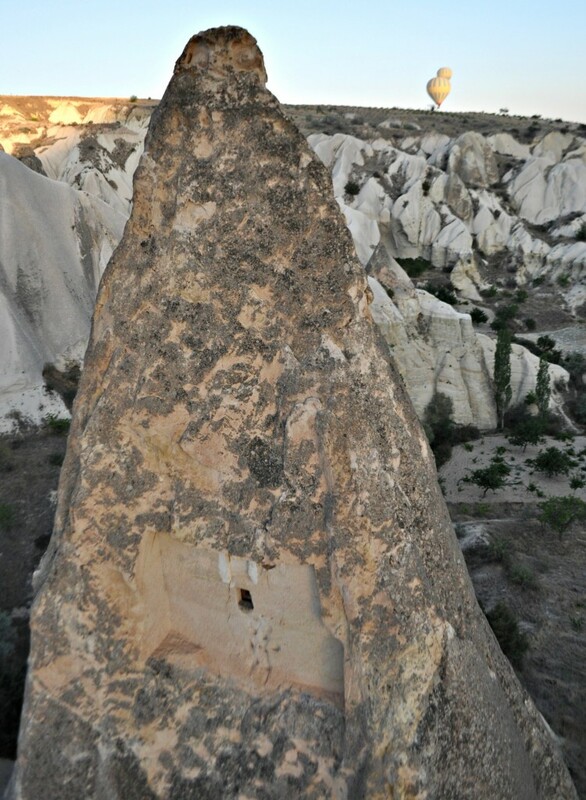 Very close to a massive Fairy Chimney. As we pass by the Fairy Chimney. 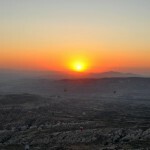 Since we ducked down into the valley, the sun rose again. Captain Mike. A wonderful pilot with a great sense of dignity and humor. 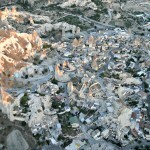 Goreme from high above in the balloon. 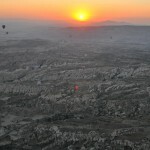 Day 529 In Beijing: Hot Air Balloon Ride Over Cappadocia, Sunrise. Jill, our whole crew, and I were anxiously waiting to see the sunrise. It seems to take a very long time to break through and each second was precious. As the light shifted, we kept being amazed, and stunned, by the colors that would appear in the sky. You could actually see the sun’s rays changing and cutting through the haze as it broke over the horizon. 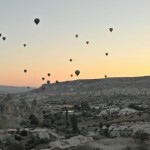 There as a beautiful silence, and awe, that everyone in the balloon seemed to experience together and it was great being able to appreciate this sight with them. There is something about traveling, and this seems to happen more when we are traveling, where you are in a group, and you all experience an amazing event together, that makes it more powerful. Even if no one speaks or talks about it, it seems to have a hold over everyone and the honor of being there, with other people, to experience this kind of magical event, even if it happens every day, is “once in a life time” for that certain group, and for me. 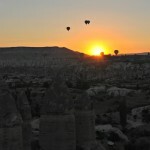 It is just another reason I love to travel and see the world. I want to see what I can see, and experience as much as I can, before I leave this mortal coil. I’m 45 and who knows how long I’ll have now. This may sound shocking, and that is my intention, because I want them to realize they have a chance, at this moment, to change their life. 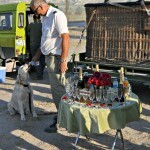 Each client has their own answer. 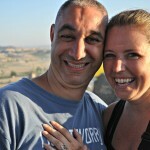 I want to have seen all 7 continents, to have seen the 7 wonders of the world, and to have shared them all with Jill. Close up of the balloon.